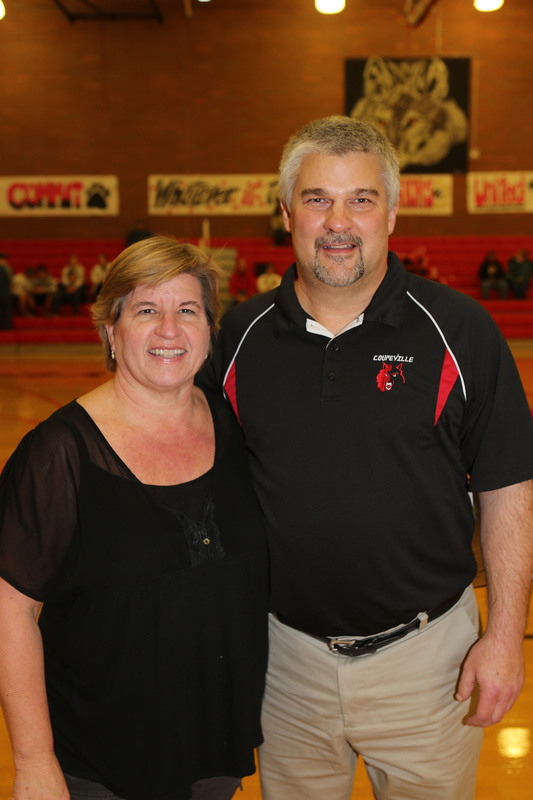 After impacting hundreds of Coupeville High School athletes over the past two decades, David and Amy King are handing off their clipboards. The Coupeville High School girls basketball coaches, who previously worked with Wolf volleyball, baseball, and softball programs, as well as little league, SWISH and middle school teams, submitted resignations this week. “As of now, this is a retiring,” David King said. “Always willing to give advice or input if asked,” he added with a chuckle. Their departure opens up varsity and JV coaching positions. After years of balancing prep sports with their real-world jobs, the decision to retire gives the Kings a chance to step back and have more time for other pursuits. That begins with the couple’s 33rd wedding anniversary, which, coincidentally, is today, Feb. 22. Three years ago, when the Kings hit the big 3-0, they celebrated in the gym with their players while preparing for a trip to the state tournament. The duo, whether coaching together or separately, are cut from old school cloth. At a time when many fellow CHS coaches are just getting started, the Kings, along with track guru Randy King (no relation) and tennis whisperer Ken Stange, are true rarities, veteran coaches who always showed a willingness to innovate. David King started in the CHS girls basketball program as a volunteer coach from 2003-2009. After taking a season off, and putting in time as a SWISH coach, he returned to high school ball, with two years as JV coach, and seven with the varsity. He also worked as an assistant coach with the school’s baseball team for three seasons, before bouncing across the street to join the softball staff. Once there, he worked with Jackie Calkins, then with his wife, putting together three years at the high school level and one with the Central Whidbey Little League juniors program. Amy King piled up 27 seasons, 24 as a coach and three as a volunteer, across basketball, volleyball, and softball. She put in four seasons on the diamond, and seven on the volleyball court. The first five were with middle school teams, the final two as high school JV coach. Her longest run came in basketball, however, where she has been involved with the CHS program as a varsity assistant and JV head coach since 2002. During that time, she worked with five different head coaches, doing stints with Greg Oldham, Geoff Kappes, Blake Severns, and Jackie Bykonen, before she and the hubby claimed total control in 2012. Preaching a love for defense, David King guided the Wolf varsity into the playoffs every season as head coach, even as Coupeville bounced through three different leagues. The Wolf varsity won 79 games between 2012-2019, covering two seasons in the 1A/2A Cascade Conference, four in the 1A Olympic League, and one in the 1A North Sound Conference. Despite running a gauntlet of private school powers in the postseason, Coupeville crafted several signature playoff wins as well. The biggest, arguably, was a 49-33 dismantling of Seattle Christian Feb. 19, 2016, a win which came in a loser-out game in a hostile road gym, sending the Wolves to state for the first time in a decade. Coupeville won three-straight conference titles, going 9-0 each time, in the Olympic League, and missed a fourth crown by a single game. While defense was his hallmark, guiding ball-hawks from Kacie Kiel to Tia Wurzrainer, David King also helped shape 11 of the top 50 scorers in Wolf girls basketball history during his time as head coach. While they had vastly different personal playing styles, Makana Stone (#3), Lindsey Roberts (#18), and Kailey Kellner (#30) were among those who thrived offensively under his guidance. Amy King, like most JV coaches, had one of the hardest jobs in prep sports — trying to win games, while also having to often juggle lineups when star players were called up to get varsity floor time. She persevered, winning 64 games with an often-depleted roster over the past seven seasons, including going 14-5 overall, 9-0 in league play, during the 2014-2015 season. Under her tutelage, future varsity standouts like Lauren Grove, Breeanna Messner, and Amanda Fabrizi made huge jumps in confidence and skills. Amy King was also famous for making sure every single player on her team scored at least once. She never failed in that task, no matter how many foreign exchange students or first-time players suited up. That fact is almost as impressive as her ability to craft a poem about a game while camped in a darkly-lit bus bouncing across the back-roads of rural America. While both had success in separate endeavors, their work together, as “Coach King Boy” and “Coach King Girl,” is how many will remember them. Their teams were built around hard work, fun, and family, then topped off with success. The Kings were the only active CHS coaches to have guided athletes in two completely separate sports to the state championships. Along with the 2016 basketball run, the duo led softball to state in 2014, breaking a 12-year dry spell for that program. CHS Athletic Director Willie Smith, who coached Wolf girls basketball (1998, 2000) and baseball (2008, 2014) teams to state, knows what it takes to build successful programs, and he hailed the duo for their success, and growth. While he will miss having the Kings working the sidelines, the Wolf AD appreciates what they brought to the school. “It has been fun to watch David grow as a head coach,” Smith said. “He’s always been willing to do whatever he needed to do to create a lasting, fundamentally-sound program.